Tamil Nadu occupies a pride of place when it comes to its banking strength. And when it comes to bank branches, number of ATMs, fixed de posits and investments in gold, the state has always come second or third in India . 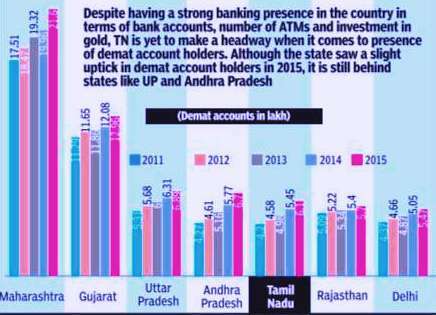 But is Tamil Nadu risk averse with regards to demat accounts that are used for investing and trading in the stock market? Going by the data, put out by the Central Depository Services (India) Ltd (CDSL), one would have to say yes. Tamil Nadu occupies the fifth place when it comes to investing in the capital markets. Shares and securities in India are held electronically in a dematerialised or `demat' account in place of physical possession of stock certificates. The state has only a 6.37% chunk of India's investor base, compared to states like Maharashtra which has 21.60 lakh demat accounts (22.60%) and Gujarat, which has 12.96 lakh accounts (13.56%). While the state has seen 12% growth in demat accounts ­ from 5.45 lakh in 2014 to 6.10 lakh in 2015 ­ it still has a long way to go before it can be seen as contributing to India's equity pool. But, what is heartening is that this growth has been consistent and the best in the last five years. Year over-year, Tamil Nadu saw a 9% growth in 2012, before dipping to 8.7% in 2013. The year 2014 saw a 9.4% rise to 5.45 lakh demat accounts, before it hit a five-year high of 12% in 2015. “It is positive to note that the overall number of demat accounts in India increased by 9.5% (96.12 lakh) in 2015.There have been an increasing number of new investors entering the stock market, bringing the much needed liquidity ,“ said Mr. Cyrus Khambata, CEO, CDSL Ventures Ltd. But while the number of investors in India went up, it did not necessarily mean heightened stock market activity. A large number of investors -nearly 75% -have not transacted even once in 2015, said CDSL. Another concern is the penetration of capital markets in India. Equity investments are limited to a very few states with the top 3 states -Maharashtra, Gujarat and Uttar Pradesh -contributing nearly 45% of demat accounts in India. 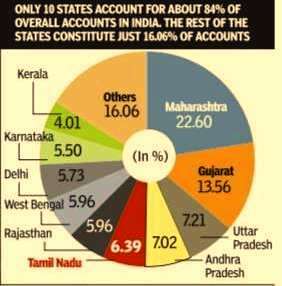 And the top 10 states, which includes Tamil Nadu, contribute 84% of total demat accounts. With gold, land, fixed deposits at the top of the charts, “a majority of investors are still not considering the capital markets as their preferred investment destination. Only the capital markets can give 100% or 200% return on investments, while FDs even with the longest tenures give only 7.5%-8% interest,“ said Khambata. Dipping into the equity markets still seems a largely urban obsession. 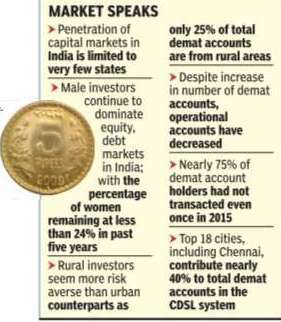 Rural investors continued to be risk averse with only 25% of total demat accounts in 2015 coming in from rural areas. The top 18 cities, including Chennai, contribute nearly 40% to the total demat accounts. Another area of skewered numbers comes with gender. Male investors continued to dominate (76%) the securities market, while the number of women investors did not noticeably improve over 5 years. Between 2011 and 2015, the number of women investors continued to hover at around 25% of the total investment pool. Based on CDSL's study , investors in India seem to be interested more in short term gains & day trading than long term investments. “The percentage of investors holding IPO allotments for only up to three days has increased considerably in the last 5 years, whereas there is marked decline in the percentage of investors holding allotments for more than a year,“ said CDSL in its report.